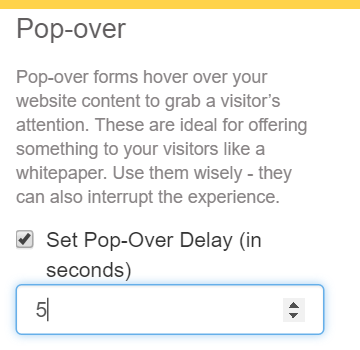 Hover-over forms hover over your website content to grab a visitor’s attention. These are ideal for offering something to your visitors like a whitepaper. Use them wisely - they can interrupt the user experience. Access the form you wish to change (How to Access Form). Scroll down to find ‘Form Type’ in the right panel and click on the ‘Pop-over’ option. Once you choose this option you will be able to set a timed delay by checking the box ‘Set Pop-over Delay’ and inputting the number of seconds of delay. You will also be able to dim the rest of the page once the form is open by checking the available box.